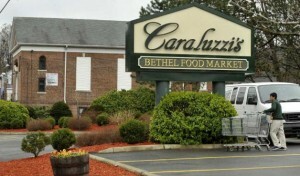 Caraluzzi’s Market is a well known one-stop shop family owned and operated grocery retailer in Connecticut. On most days in any of Caraluzzi’s Markets or liquor store you can find family members on hand, working with their employees and customers to improve every aspect of the business. In 1949, after 27 years of refining his grocery knowledge working for Gristedes, Anthony Caraluzzi Sr. purchased the Bethel fruit and vegetable market. Working with his son, the Caraluzzis converted the market into a full grocery store adding meats, dairy and other grocery items. The store eventually moved to its current location and expanded in size, adding a bank with an in-store teller. The grocery store doubled in size in 1989, following an expansion allowing for a full fresh bakery and prepared hot foods section. At this point Anthony Sr’s children and grandchildren were already involved in the family business. In 1997, Tony Jr’s daughter Jennifer joined the family business and opened Caraluzzi’s Nutmeg Discount liquors. A few years later the original Bethel store was remodeled and the expansion led to larger aisles and a greenhouse entrance. The supermarket also opened a full-service floral department and a sushi bar. In March 2003 a second location was opened in the Georgetown area. Another location was opened in Newtown in 2008, adding a cheese department, prime meats, and a Wi-Fi cafe. All three generations of Caraluzzis are still involved in running the business, and even spend time working in the stores. They get to know their employees and customers, allowing for better communication and improvements tailored to their clienteles needs. Do you carry A2 milk?